18 Mar Are Chatbots really the Future of Web Development? There is no doubt in the fact that the whole world is gradually shifting from the traditional market to the digital market in almost every sector. The most prominent reason for that is because the need for convenience is increased. And that need did not go unnoticed by web developers. That is what Chatbot is- a place designed for users where they can have a one-to-one conversation with the bot and find everything that they are looking for just in one conversation. A chatbot is a shorter form of “Chatterbox” and means exactly what the name suggests- it is a box where you can chat! It is a computer program that interacts with customers exactly like a human through either voice commands or text or both and answers all your queries. A chatbot is an artificial intelligence (AI) feature that can be and is being used by major messenger applications. Basically, Chatbot is a platform that increases your convenience to find things. Let’s break this into parts and understand it this way. For instance, when you open an application on your phone to find something or get something, you always have to proceed in a number of steps before you can reach the final stage, eg. If you want to buy a shirt online from a website, first you will have to open the men/women section then choose the clothes you are looking for then find your size then buy it i.e. you are sent from one location to another. Chatbot makes this task easier for you, rather than being navigated from one place to another on the app, you can simply open the chatbot on the site, and then text whatever you need in one simple conversation and Chatbot will find that for you. In other words, initially where you had to find everything on Google in some links, now you can find everything in the form of questions and answers! All you need to do as a user is ask a question & the chatbot will give you an answer. Why is Chatbot important to web developers? In the technology-driven world that we are living in, where there is competition in every sector you go, it is not easy to break through the clutter. The trends are changing giving rise to the use of Chatbots; there are a million apps today amongst which the users can choose, however, the chances are very low as on an average, a user only downloads one or two apps on his phone in a period of one month. Users today only like to download apps on their phone that are interactive and do not consume a lot of their time to find something that they want. This is exactly what web developers need to understand, the needs and likes of the users are changing and if you want your app to stay on the top, it is time to make your app interesting! As for now, a lot of big ventures have given space to Chatbots in their apps so that they can enrich the experience of their customers on the app. Needless to say, the customers are not just enjoying it, but prefer it over apps that require them to jump from one place to another to proceed to find something. Why is Chatbot the future of web development? In the dynamic world that we are a part of, change is the only constant. More or less, the users always need something new and interesting on the app they are using, and web development companies want to make their platforms as user-friendly as they can so that they can engage more and more people towards their network. If they fail to do so, the users have a very convenient option to switch to a different app altogether. 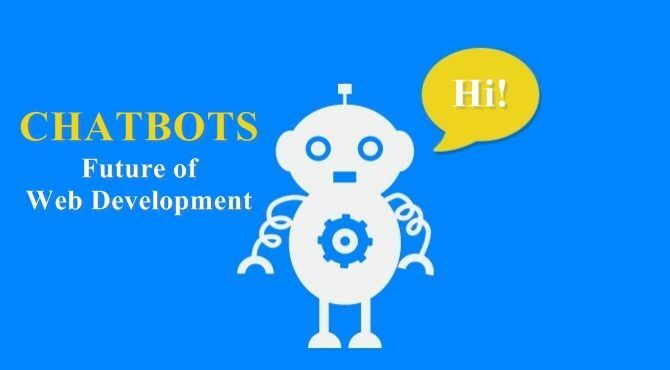 Amidst all of this, the reason because of which the web developers that will have Chatbots will have a hold of the market is because of the benefits that Chatbots have both for the users and the web development companies. No user would prefer using an app that isn’t interesting or engaging; with Chatbot, the users can live chat with the program and there is always the assurance of getting an instant response. The best part about Chatbot is that it is available for the users all the time. No matter what time of the day it is, there would always be a reply! Imagine this, the bigger the company is, the higher the number of employees for client service in the company would be. And of course, that would cost the company a lot because every employee has to be paid. However, getting Chatbot is only a one-time investment, since it cuts out the need for having employees for client servicing; Chatbots can handle thousands of customers at one time. Instead of being navigated from one page to another on an app to find something, the users can access it all just in one go at Chatbot. All that you need to do is text your requirements and the chatbot will find everything for you! The best thing about Chatbot is that it works as per your convenience, depending on the app, you can literally ask anything and the bot will have an answer for you.